FROM 1967 TO 2012 …….. 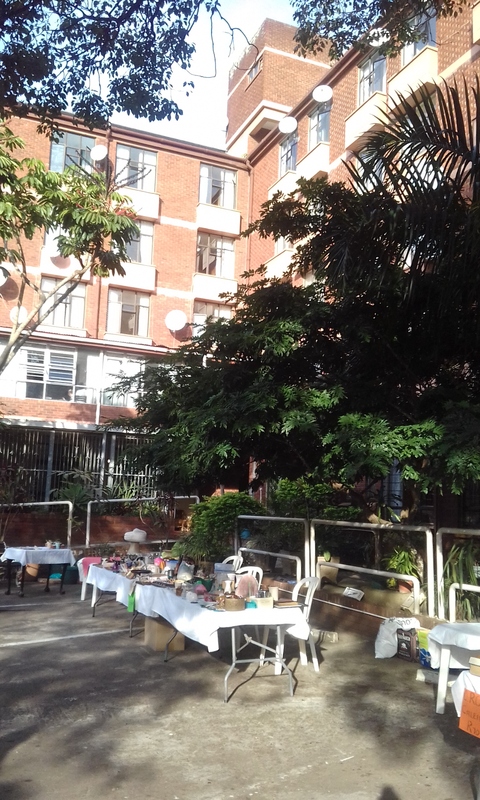 The property at 502 Moore Road was bought by the Mothwa of Southern Natal for R16 00000 the proceeds of a bequest of R25 000.00 left to the Mothwa by a Mrs Hingham for the Ladies of Natal. On the property there was a double-storied house that was built in the late 1880’s. It stood in a beautiful garden with an enormous Camphor tree that branched out across the pan-handle into the next property. There is still a very old Ficus Tree on the back boundary. 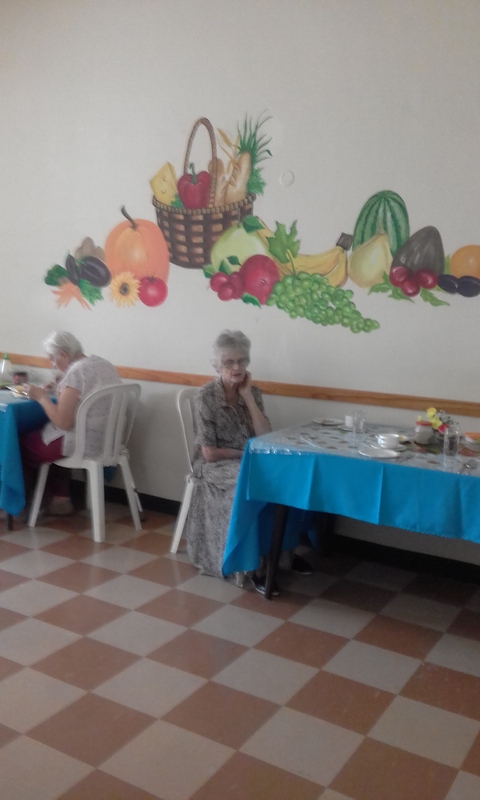 The house was able to accommodate 16 residents, all fairly aged and in need of a certain amount of care. Matron Davidson was the first Matron and the Committee was chaired by Mothwa Marie Forge. In 1977 the old house was beginning to show signs of wear i.e. the curse of Natal – Borer ! In our bank we had the enormous amount of R180 000.00 – we just had to do something with it ! 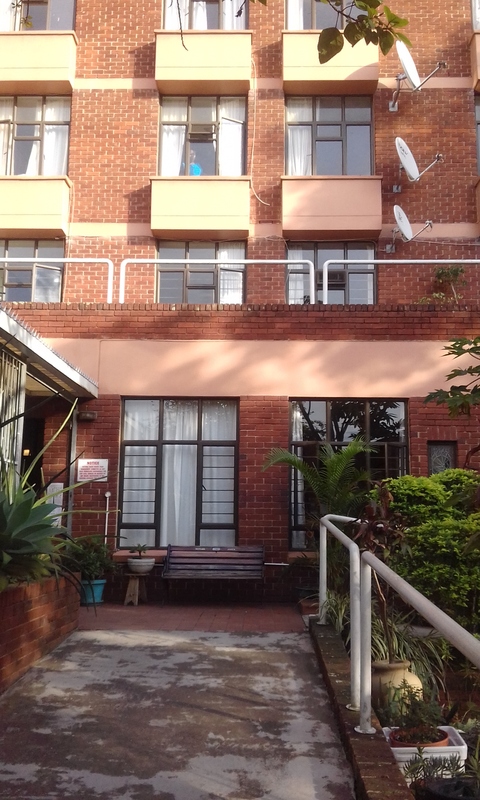 A few Mothwa were looking at existing buildings to buy, but the prospect of developing our own beautiful property, set in the best part of Durban’s Berea, was a more pleasing prospect, so tentative plans (for the envisaged two wings of 5 floors) were drawn, with the help of Moth John Davis of Davis, Michelow and Harwood. He secured the services of Architect Jack Blumenfeld for a small fee. These plans were presented to the Mothwa at a Quarterly Conference and unanimously accepted. It was decided that we should start with the First Wing only, to retain the Old House and the second wind to follow when funds become available. In 1977, Southern Africa was in a global recession and very little building was taking place, so with this in mind John Davis was able to contact professionals in the building industry who were prepared to give of their services for little reward. The total cost would be R200 000.00 ! The remaining R20 000.00 would be raised by the Mothwa, doing what they are best at, FUNDRAISING ! Catering for weddings, functions, dinners, fete on North Beach, civic receptions, Mayoral cocktail parties and a Mayoral afternoon tea party, but the biggest continual fundraising however, was the City Hall, where we had a contract to cater for all shows at the City Hall, serving tea at half-time and a coke and sweet counter. 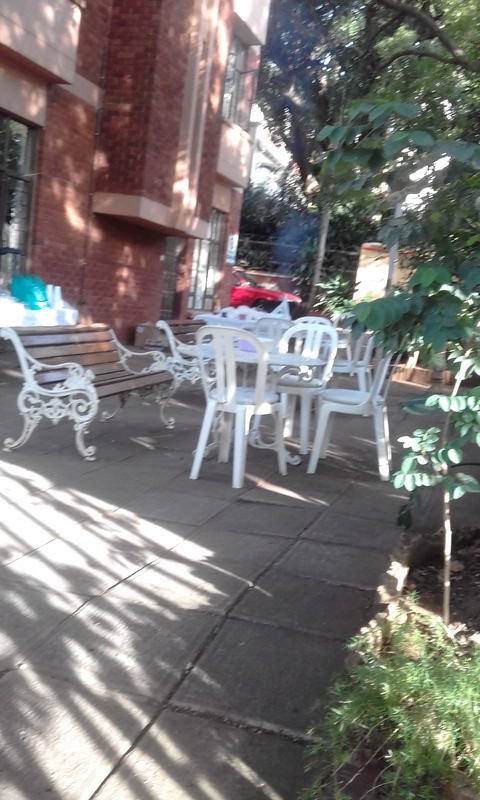 We had at that time 23 Mothwa Shellholes but only local Shellholes could take on City Hall duties on a rotational basis, under the watchful eye of Mwa Ma Greyling (as she was affectionately known). There was no problem in getting to the City Hall in those days, buses ran until late, we had our own on-site parking for those with cars and the streets were safe. 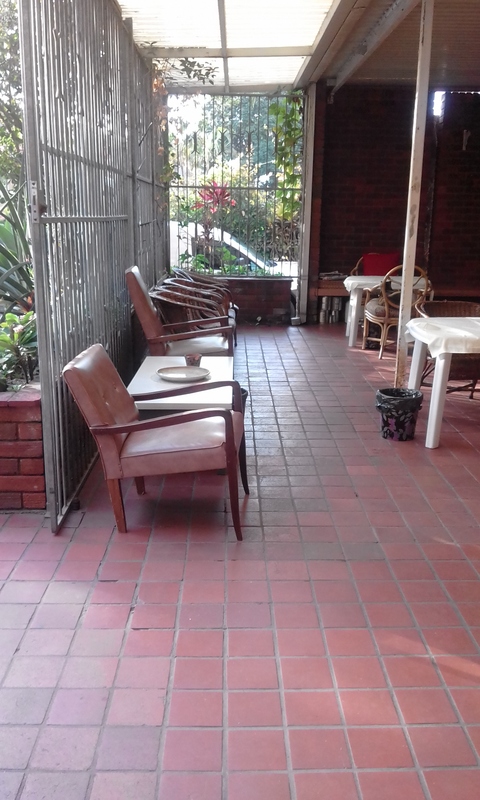 We got our R200 000.00 but needed another R20 000.00 for furnishing, this included a state-of-the-art kitchen, all stainless steel with only the best equipment supplied by Hotel and Bar (now defunct), and caustic floor tiles which are still like new. The dining room was next to the kitchen with double doors leading out onto a covered verandah. The lounge was the size of 3 bedrooms which were later converted to bedrooms when the second wing was built. An Otis lift was installed, big enough to take a stretcher. There were 44 residents, three beds reserved for men. All floors (except for passages) were covered in Cozy-Tred supplied at a very low cost by Moth Corbishley. Passages were in floor tiles (still the same being used today). Our Haven need a new name. A competition was held for the best name. Many entries came in, i.e. Harmony, Twilight, etc., but in the end “Mothwa Haven Moore Road” was judged the most appropriate. On 1 April 1078 the Haven was officially opened with all Mothwa attending. What a glorious day it was, bringing with it many happy memories of hanging curtains, cleaning and polishing everything, all looked so grand and we were pleased to welcome everyone to tea. The Mayor and his wife, all Moth Officials, anyone who helped towards the eventual cost, and of course, our own National Headquarters and Mrs Evenden, wife of “Moth O”. Now we felt it time to start on the Second Wing (the need was there and the plans approved), but this time we had to borrow money from the Government. The original plans drawn by Jack Blumenfeld had to be altered to accommodate a small lift. The loan would need to be R640 000.00, exactly three times the cost of the first wing 7 years earlier. There would be ad advance of R300 000.00 repayable at 1.20% interest and the balance at 1%. All the plans were drawn to Government regulation size, and included accommodation for a Matron and Housekeeper on the second floor (this necessity has now fallen away but the areas have been well used for an office and another two bedrooms. We now had a total of 80 beds and we were granted Government subsidy for 60% indigent and 40% with an income higher than an Old Age Pension. The Government pledged their commitment to NGO’s for helping them to look after the Aged, a job that should have been their’s ! They have kept their pledge but unfortunately it has not increased with inflation, and at time of writing is way behind the cost of keeping one person in a nursing situation. The second wing included a very spacious lounge, with 80 Imbuia vynol covered chairs, a beautiful old piano donated, pull-out Tuck Shop, a library and a small section of the lounge enclosed for cardroom/writing room, a public telephone, the original fireplace with all the brass tools, a leaded light window from the front door of the original house. The backyard houses the laundry and servants ablutions and staff dining room. THEN in 1990 the Government (still the old National Government) decided to offer the Homes, who had Government loans, the chance to redeem their loans and take full possession. This we gladly accepted and were able to pay the R180 000.00 required off the remaining portion of the loan, which was then R580 000.00. NOW WE WERE THE FULL AND PROUD OWNERS OF MOTHWA HAVEN MOORE ROAD ! The Title Deeds are with National Headquarters. 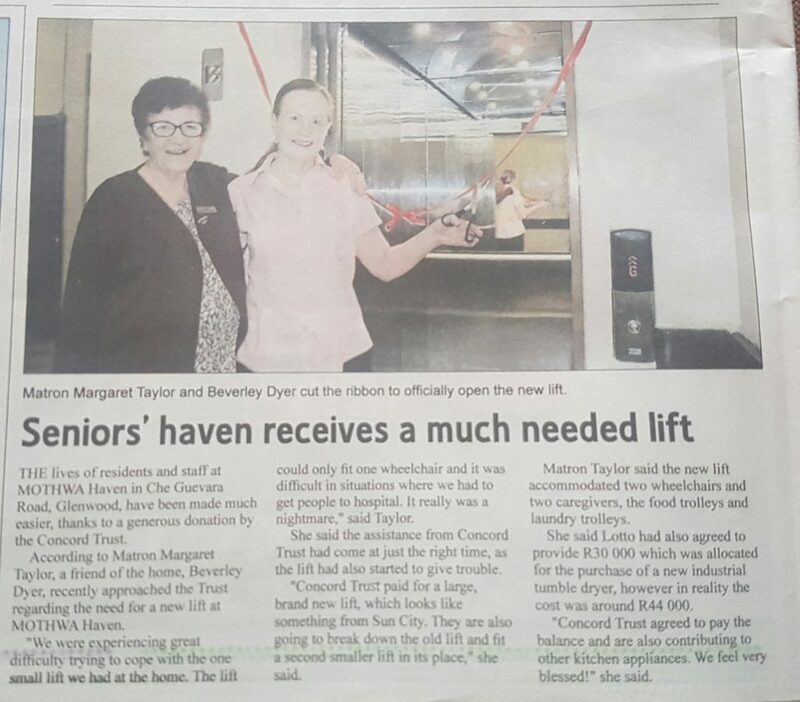 We have had a total of five Matrons and a wonderful staff and many volunteers. Well, the rest is history. We are still going strong after 34 years, caring for the aged in the community. With some ups and downs we never gave up, but its thanks to the Mothwa of Sothern Natal who were behind this wonderful Memorial to our Order. Who, in the next decade or two, will be responsible to write the next installment ?